Home Lifestyle	Register to vote before it’s too late! Register to vote before it’s too late! I am taking a break from the Who Gets Your Vote series today to give you a friendly reminder to REGISTER! You can’t vote otherwise and wouldn’t that be awful!? In some states you only have a couple more days so be sure to look up your state and get to it! NC Voters, here is our registration info. The clock is ticking!! October 12, 2012, 5pm – Voter registration deadline for November 6 General Election. Forms must be postmarked or delivered in person by 5:00 pm today [NCGS 163-82.6(c)] *Individuals who miss the registration deadline may register in person and then vote at one-stop voting sites in the person’s county of residence during the one-stop absentee voting period (October 18-November 3). In order to register during a one-stop period, the applicant must show acceptable proof of name and residence in the county. Below are a list of websites to check out while trying to decide on the best candidate for you. Stay tuned for another interview next Tuesday and thanks for reading! 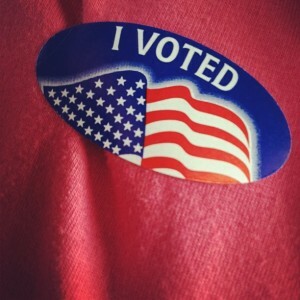 And don’t forget to check out all the past voter interviews! The deadline in Colorado is today! It is so important to register and participate.